Super Hero Boy: Only fueling my children's shoe addiction. Only fueling my children's shoe addiction. Eleven is one of the companies totally responsible for my massive children's shoe addiction. It's funny as I've never been a shoeaholic when it comes to my own shoes. Sure I like pretty shoes but I'm pretty much a flip flops or sneakers sort of girl. Connor on the other hand walks around in incredibly stylish shoes such as these sneakers, Joseph, from Eleven. Really the only difficult part of buying a pair of shoes from Eleven is deciding which shoes to buy as I find it nearly impossible to name a favorite. What really makes me completely and utterly jealous of these shoes is just how incredibly soft the leather is and how flexible the soles are. No detail has been spared from the mock laces to the very heavy duty velcro straps you can really tell the shoes were made with care. 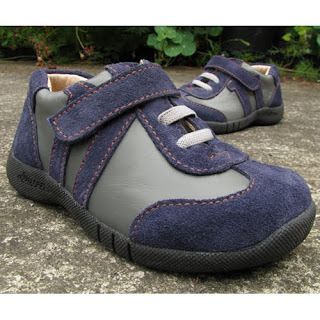 Ready to wear right out of the box with no break in period, your child will be utterly spoiled once they put a pair on. Connor already has opinions about his shoes and he is the first to tell me if a pair of shoes just doesn't feel right. The best part though is we have two boys now (Connor plus one due in just a few weeks) and these shoes hold up great which means every pair in our collection will eventually be owned and loved by two little boys. Right now if you buy two pairs shipping is free! I know we'd love to have another pair of Caspers and a pair of Iggys, we've admired Iggy for a long time and its currently on sale as well! Visit the Eleven Collection to see all the styles currently available! Eleven would like to share a pair of shoes with one of my readers as well! One lucky winner will recieve a pair of shoes in their choice of size and style. Leave a comment on this post. Just check out the Eleven Collection website and tell us which size and style you'd want if you won. Styles sale out pretty fast this time of year so give me your top three choices. This contest will end Dec 31th at midnight! I would love the Nora boots in size 10 for my daughter! Phoebe in size 9, please. The Luc boots are my favorite. My second and third choices would be Simone and then Pixie. All in the smallest size available. Love these shoes. Fingers crossed. anya in a size 13 which is the only size they have left! I'd pick Mira in size 10, but it was a hard choice bc they are all great. I like the Mira in Size 9 or 10. If I were to win, I'd need size 1 for my God-daughter. i would like aubin, carlo or finn size 9 for my son! I like the Josef style. I think my nephew wears a size 3, but I'd have to check with his mom. I like the Nora boots. Thanks for the chance. I would want the Phoebe!! The Phoebe, Sylvie and Alexi are my top 3 and in size 3. All just too cute!!! We are dealing with 'growing into', so any of these would be good on my grandson's shelf, waiting for his feet to match the size! I love the pretty Sylvie shoes in size 11-so pretty! I would get the Josef in a size 11 for my son. Thank you for the giveaway! I like the Laura shoes for girls and the Josef and Aubin shoes for boys! I love Josef, Finn, Martin, Dublin, and James... Okay, I know you said only three, but... They're so cute! yahoo reader subscriber - jill and mike2 at yahoo (dotcom) thanks! Any of these would be fabulous!!! I would choose size 12 in style Josie. Second: Eleanor. Third choice: Oslo. I'd choose the Dublin boots in size 9. The Nora in size 3 or the Katina in size 3. #1 would be Sylvie in size 13. I also love Alexi and Mira. Very cute shoes. Mira, Eleanor and Katina would be my TOP 3. In the smallest size available. Mira, Simone and Nora Size 9 or 10. Thanks for the chance to win! i subscribed to your feed by email! I love the Caper in a size 13. So cute! I like the Simone boot, the Maya sandal and the Nadia sandal in size 11. Thank you!! I like the crawford brown in a size five! These shoes are so adorable! I'd love to have the Josie's, Kasota, and Simone in that order. Thanks! My top 3 choices in Boys sz 2 would be Julian, Aubin and James. I love the Phoebe in size 12, the Mira in size 12, and the Helena in size 12! I like the Josef shoe in size 10. The Carlo shoes in size nine are my favorite. I'd love the Simone boots in a size 7! I would like the Simone in size 1. My top 3 would be Trevor, Caper and Julian in a size 2 for my son! Subscribed to the Seven Dogs and A Baby mailing list. The Sylvie boots in a 1, the Josie shoes in a 13 or the Mira shoes in a 13 would be awesome! My top 3 choices are Josie, Helena, Katina, all in a size 13. My top picks are Trevor, Kai and Alistair, all in size 3! I LOVE, LOVE, <3 them all really, but the JOSIE are something we could wear everyday, and I KNOW Eleven is up for that challenge. Hope your New Year is SAFE and REWARDING! I like the Sylvie in size 9. I like the Sylvie, Astrid and Mira in size 9 or up.